Happiness Is a Mood Not a Destination: Our favorite summer activity! It's really Tuesday already?! Gosh. Just a week until school starts back up. Where has the summer gone? Is anyone else feeling that way? We had a nice relaxing weekend. My mom and Brian both worked all weekend so it was father/daughter time. We went to dinner, relaxed in the backyard and went to the lake for a bite. While there I realized that I actually havent shared with you all the one thing that makes our summers awesome. I've mentioned it to some of you a few times and always get the usual "oh my, that's so cool!" What am I talking about? If you've read this here blog long enough, you'd know I mean Jetskiing. It's something we look forward to every summer. Getting to relax, eat, have fun and spend time with family. Whats better than that? Let me back up a minute. Two of my Uncle's had wave runners before us. We'd go and ride on theirs. We had gone out on some while on vacations but it hadnt been as personal. We may not be the most adventurous people but being on the water, in the open air and having fun at the same time seemed like our speed. Everyone kept saying that we should get one. We didnt have any "toys" before. My mom had her fancy camera to do photography but my dad didnt have an "outlet' He worked 12 hours 5 days a week and wasnt able to enjoy going on fun outing with us, so this would be his time. My parents toyed around with the idea. Surprisingly buying a wave runner isnt something you can take lightly For one it cost ALOT of money. About $8,000. Who knew, right? I'm pretty sure my parents jaws dropped when they heard the price. You have to have it winterized every year, re-registered also like a car which costs a good chunk and just the small maintenance If something goes wrong with it, well you better hope it's nothing extreme. You also have to watch out when your in the water. One of my uncle's has had to pull his out many times due to something getting stuck in the bottom. It took about a year of debating. Was this something we'd be able to afford? Would it be worth it? Would we still love it in a few years? This was a long term thing, not just something we could sell at the end of summer. They finally came to the agreement to buy one. They bought it in May of 2009 and we couldnt be happier! It's something that has made our lives so much more fun. The thrill of going 50 miles an hour in open water, getting wet from the other waves. Sometimes we jump off in the middle of the lake. We park it at the sand bar and just float in the water. I feel happiest when I'm out there. I have peace, I can think, I feel calm. If you can afford it and it's something you'd be interested in, I say go for it. It's brought our family closer together. You may have noticed that in the second paragraph I refereed to it as a Jetski but after that I called it a wave runner Well, that's because they are different. Yes, a jetski and wave runner are two different things. It's something you probably wouldnt know if you arent into boating and all that. A wave runner is considered a boat. That's what we have. A wave runner can fit 3 people while a jetski can only fit 2. While in the water, you can sometimes stand on the jetski and drive. With the wave runner you cant. In some bodies of water they say you can only have boats and not jetskis. We fit that criteria. If I were to give a review, I'd say a wave runner is better. Maybe I'm a little biased since I've rode on a jetski maybe once but just from observing the wave runner seems to be safer Reason being is that it's heavier. A jetski seems like it would tip very easily. Dont get me wrong, a wave runner can tip too if you make a mistake. A mistake you ask? Yup, there are rules for riding a wave runner Rules besides no standing and stuff l like. You have to turn into on coming waves. If the waves are big, be prepared for a bath! If there are two people on the thing and you are making a turn, one person has to lean to the left and the other to the right. I get so freaked on that part! One time Brian took out a wave runner and I hopped on the other with my dad. Went went out to the middle and met up with each other. They both stopped and just let them float. After being done talking my dad started to go but because of the angle, the wave runner started to turn...and we both fell in. Thank goodness for life jackets! Dont they look like twins? We can never tell who is who when they are out in the water together. One Uncle has a boat. We loved riding in it! Nothing better than riding side by side! 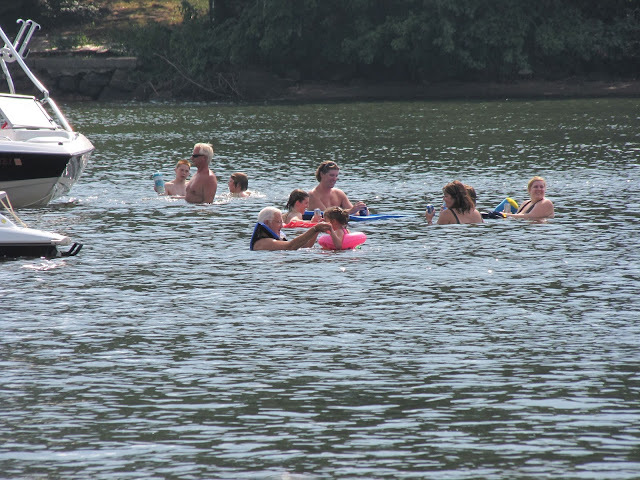 The girls have fun at the sand bar! Riding around while the sun is setting is breath taking! What kid wouldnt love this? You are so lucky to have such a BIG and close family! 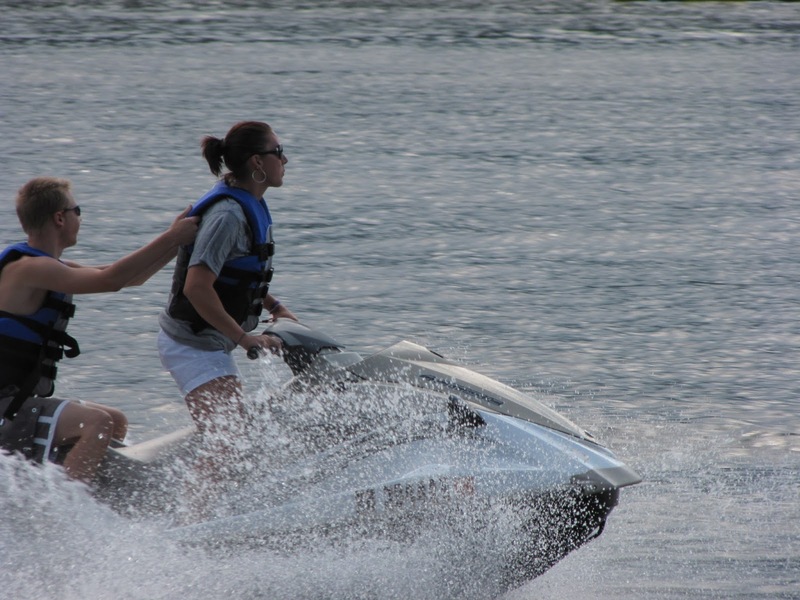 I love looking at all of the photos :) PS I have only been jetskiing once but I loved riding the wake!